This stunning, circle award with faceted rim is hand-cut in flawless optical crystal. It is mounted on its own plinth. 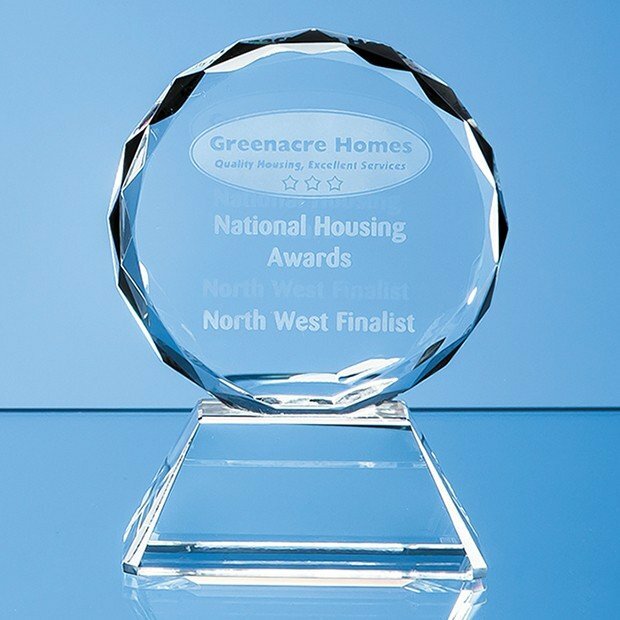 Available in three sizes â€“ 9cm (shown), 11cm and 13cm – these awards are ideal to present on their own, but also for creating 1st, 2nd or 3rd place prices or awards recognising different levels of achievement. Alternatively, to commemorate a special family or business occasion. Featuring classic hand polished, facet cut edges its generous engraving area allows you to add your logo, crest, message and date. It will stand-out when displayed on a shelf or in a cabinet at home or in the office and comes complete in its own presentation box.